Mimosa pudica (from Latin: pudica “shy, bashful or shrinking”; also called sensitive plant, sleepy plant, Dormilones, sleeping grass, or shy plant) is a creeping annual or perennial herb of the pea family Fabaceae often grown for its curiosity value: the compound leaves fold inward and droop when touched or shaken, defending themselves from harm, and re-open a few minutes later. The species is native to South America and Central America, but is now a pantropical weed. It can also be found in Asia in countries such as Bangladesh, Thailand, India, Indonesia, Malaysia, Philippines, and Japan. It grows mostly in undisturbed shady areas, under trees or shrubs. 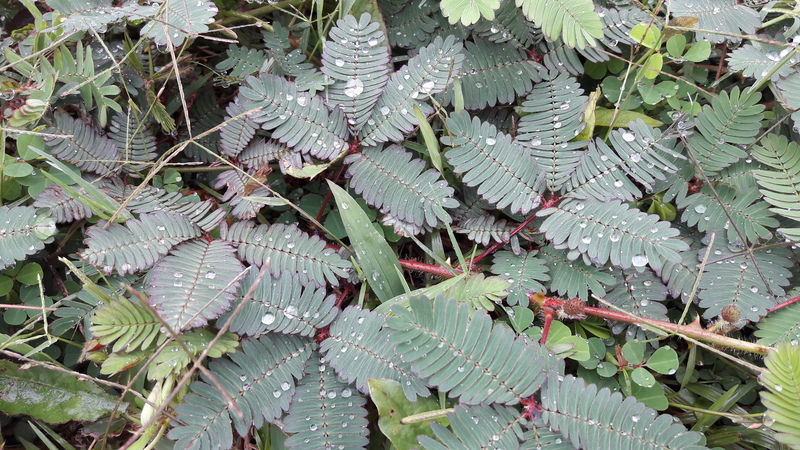 The species is known by numerous common names including sensitive plant, humble plant, shameplant, and touch-me-not. The stem is erect in young plants, but becomes creeping or trailing with age. It can hang very low and become floppy. The stem is slender, branching, and sparsely to densely prickly, growing to a length of 1.5 m (5 ft). The leaves are bipinnately compound, with one or two pinnae pairs, and 10–26 leaflets per pinna. The petioles are also prickly. Pedunculate (stalked) pale pink or purple flower heads arise from the leaf axils in mid summer with more and more flowers as the plant gets older. The globose to ovoid heads are 8–10 mm in diameter (excluding the stamens). On close examination, it is seen that the floret petals are red in their upper part and the filaments are pink to lavender. The fruit consists of clusters of 2–8 pods from 1–2 cm long each, these being prickly on the margins. The pods break into 2–5 segments and contain pale brown seeds some 2.5 mm long. The flowers are pollinated by the wind and insects. The seeds have hard seed coats which restrict germination. The roots of Mimosa pudica create carbon disulfide, which prevents certain pathogenic and mycorrhizal fungi from growing within the plant’s rhizosphere. This allows the formation of nodules on the roots of the plant that contain endosymbiotic diazotrophs, which fix atmospheric nitrogen and convert it into a form that is usable by the plant. 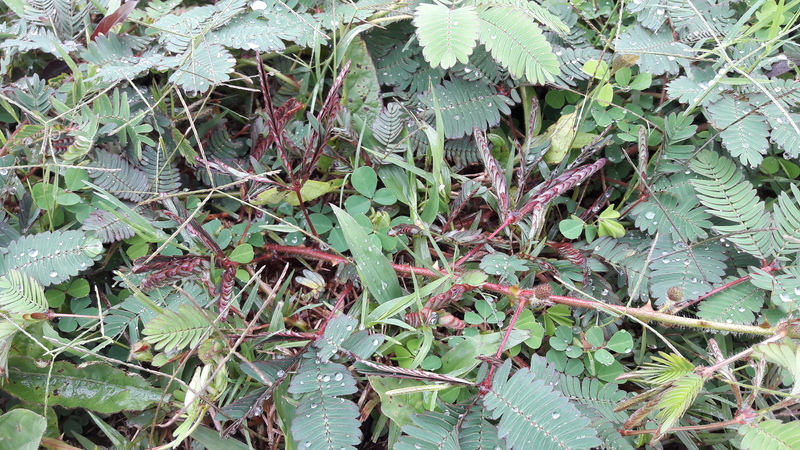 Mimosa pudica is well known for its rapid plant movement. Like a number of other plant species, it undergoes changes in leaf orientation termed “sleep” or nyctinastic movement. The foliage closes during darkness and reopens in light. This was first studied by the French scientist Jean-Jacques d’Ortous de Mairan. The leaflets also close when stimulated in other ways, such as touching, warming, blowing, or shaking. These types of movements have been termed seismonastic movements. The stimulus is transmitted as an action potential from a stimulated leaflet, to the leaflet’s swollen base (pulvinus), and from there to the pulvini of the other leaflets, which run along the length of the leaf’s rachis. The action potential then passes into the petiole, and finally to the large pulvinus at the end of the petiole, where the leaf attaches to the stem. The action potential causes potassium ions to flow out from the vacuoles of cells in the various pulvini. This causes water to flow out from those cells by osmosis through aquaporin channels, making them lose turgor, which is the force that is applied onto the cell wall by water within the cell. Differences in turgidity in different regions of the leaf and stem results in the closing of the leaflets and the collapse of the leaf petiole. It is not known exactly why Mimosa pudica evolved this trait, but many scientists think that the plant uses its ability to shrink as a defense from herbivores. Animals may be afraid of a fast moving plant and would rather eat a less active one. Another possible explanation is that the sudden movement dislodges harmful insects. Credits: Wikipedia the free encyclopedia. Really? Once the leaves close, it will open in 2 hours. Thanks for commenting 🙂 ! Reblogged this on Creative Crafts DIY. Very informative post. 🙂 That mimosa is so pretty. Thank you. I love when the leaves close too. It’s a very amazing plant. A very technical explanation Dan. I love your pictures too. Did you take them? Some, but not all of them. Thanks for visiting! Mimosa pudica is so cool! I want one!! !